A still life painting in San Francisco dismissed by many experts as a fake Van Gogh has now been accepted as authentic. 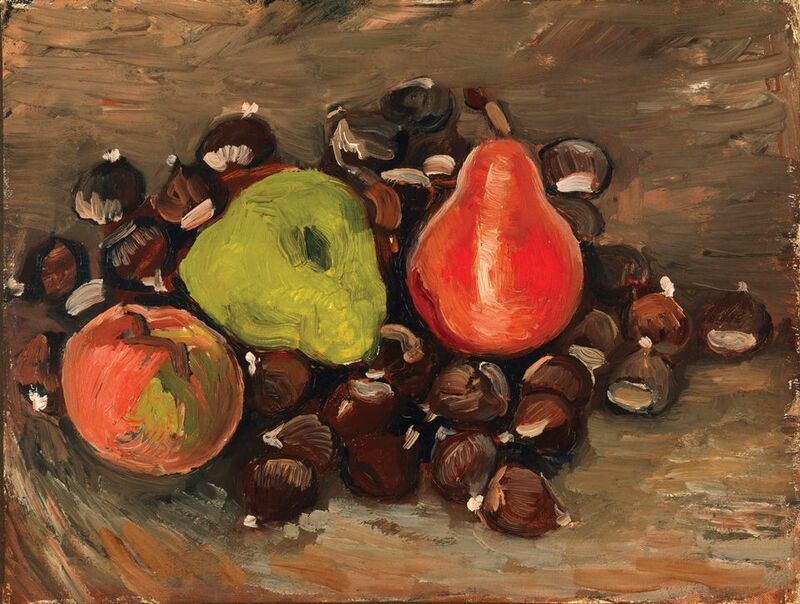 The picture of fruit and chestnuts, at the Fine Arts Museums of San Francisco, has been dated by specialists at the Van Gogh Museum to the autumn of 1886. Thomas Campbell, who moved from New York’s Metropolitan Museum to become director of the San Francisco museums last November, says the painting demonstrates “Van Gogh’s experimentation with techniques learned from studying Flemish old masters as well as the Impressionists”. This should enable visitors to see “the dialogue between works from our European paintings collection”. Still Life with Fruit and Chestnuts depicts two pears and an apple nesting in a cluster of chestnuts, suggesting an autumnal composition. Inscribed on the reverse of the canvas is the phrase “Nature mort, peint par Vincent van Gogh”. In 1960 Bruno and Sadie Adriani donated the painting to the Fine Arts Museums of San Francisco. However, at that point it was assumed to have been done by Van Gogh in Nuenen in 1884 and the colouring appeared unusual for that period. This raised concerns and the painting was apparently not displayed. The picture was not included in the two standard Van Gogh catalogues by Jacob-Bart de la Faille (1970) and Jan Hulsker (1996), and more recently has been rejected by Walter Feilchenfeldt (2013). Specialists at the Van Gogh Museum in Amsterdam have now accepted it as authentic. They determined that the canvas and the paints match Van Gogh’s work. Stylistically, it is regarded as fitting in with the still lifes which the artist made in Paris between October and December 1886. The painting’s provenance can now be traced. There is reference to “pears and chestnuts” in an 1890 inventory, compiled shortly after Van Gogh’s death, with the word “Bernard” added. This is assumed to refer to his friend Emile Bernard. Bernard’s mother sold a work with that title (and the dimensions of the San Francisco picture) to the Parisian dealer Ambroise Vollard in 1899. The first husband of Sadie acquired the picture in 1922. Sadie, an American artist, later married Bruno Adriani, a German lawyer and cultural official, and they emigrated to America in the 1930s. The picture was donated to the San Francisco museum in 1960, where it has mainly been in storage. Although labelled as only a possible Van Gogh, it has been exhibited at San Francisco's Legion of Honor Museum in 1984, 2004-10 and since 2014. The still life was also lent to the Wallraf-Richartz-Museum & Fondation Corboud in 2012, for an important exhibition curated by Barbara Schaefer on the centenary of the 1912 Sonderbund exhibition of modern art. Schaefer says it is “fantastic news” that the picture has now been fully authenticated. The Amsterdam museum has also made another important discovery: infrared reflectography reveals that the artist reused the canvas. Originally Van Gogh had painted a portrait, but always short of money in Paris, he sometimes painted over earlier works. The original portrait appears to be a female wearing a scarf, probably done some months earlier when he was in Antwerp. Still Life with Fruit and Chestnuts is to go on loan to the Städel Museum in Frankfurt, for the exhibition now entitled Making Van Gogh: A German Love Story (23 October -16 February 2020). The show focusses on Van Gogh’s works which were acquired by early collectors in Germany, in this case in 1922.